Wherever I might be, I gravitate towards water. Ponds, lakes, rivers, marshes or the sea - these are the places I love. I firmly believe that a landscape is incomplete without water forming a key part of it. To those who love to lounge beside lakes, to roam by riversides, to malinger in marshes, to go footloose through fens, or tarry on the tideline; this book is for you. 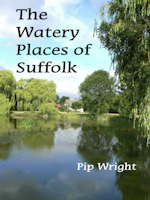 The book has 60 pages with dozens of full colour pictures including some by Suffolk wildlife photographer, Richard Weale.